One watercolour painting on paper. 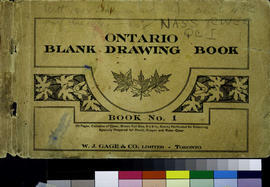 Sketchbook with drawings from Carr's 1928 sketching trip. Includes monumental poles, village sites, landscape and forest forms. Geographical areas are the Nass River and Haida Gwaii, with emphasis on Skedans village site.